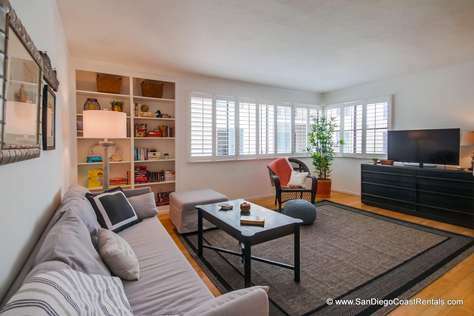 Relax in this spacious and modern 1 bedroom / 1.5 bathroom recently remodeled condo located at the southern tip of the Mission Beach Peninsula. This 2nd floor condo boast both ocean & jetty channel views from the private west facing balcony. This unit provides plenty of space for small families or couples looking to vacation in style and have way more space than a typical beach front condo or hotel suite. This unit sleeps a maximum of 6 guest (4 adults max) and provides gated parking for 1 car located on the ground level of the complex. This property also provides an outdoor shower for guest to rinse off after a fun day playing in the sand and Pacific Ocean. If you like to stay active during your beach vacation this unit will provide you with the perfect home base. The famous Mission Beach boardwalk is just a mere 75 yds away from this complex. Once on the boardwalk you can walk, fun, skate board, or ride bikes for miles on end along the ocean as well as Mission Bay. If water sports are more your style you are literally just a few hundred yards from the ocean water (as well as bayside beach and water) were you can enjoy, surfing, paddle boarding, kayaking, swimming, and even kite sailing or surfing. There are also 8-10 city owned volleyball courts just a short walk away to enjoy one of San Diego's beloved beach sports. You will be glad you chose this Ocean Front Gem as your accommodations and will want to return every year if not multiple times per year!!!! 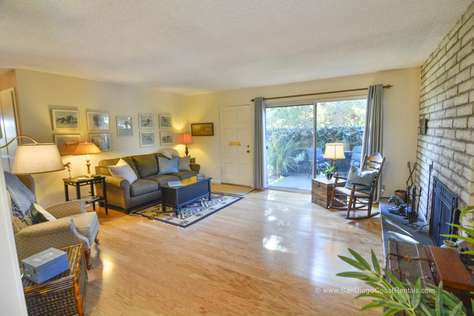 Enjoy this quaint 1 bd / 1 ba ground floor condo located just steps from the sand in Mission Beach. This property allows guest to enjoy beach living like a local and is surrounded by tons of activities, restaurants, and shops while still providing comfort and privacy of a private residence. This unit is perfect for a couple or small family with children. Guest will have access to a fully furnished kitchen, spacious bedroom with full bathroom (tub / shower combo), and living room area with flat screen TV. Property also provides cable and wifi access and parking for 1 car. 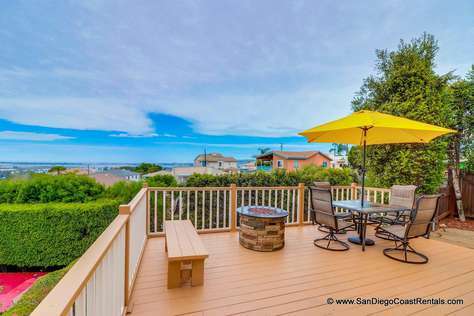 Looking for a really cute, cozy San Diego beachfront vacation rental for a small family or intimate couple? The Paradise on Toulon Court is all that and more. 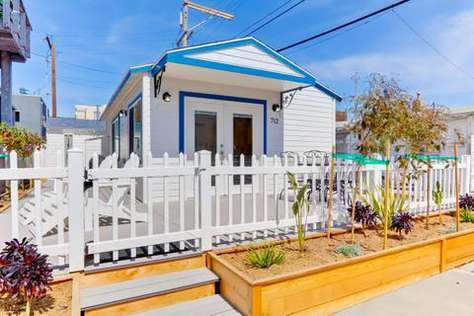 Beach cottages are a rare find, and this one is delightful! Immaculately laid out and maintained, this cottage enjoys lots of windows, inviting peaceful ocean breezes and sunlight in. Leave a window open at night and let the gentle sound of ocean surf lull you to sleep. Sit out on the deck, enjoying morning coffee while enjoying the ocean view. From the short white picket fence that surrounds the property to the cheery, clean and modern interiors, you’re going to love this place! And yes, your family pets are welcome too! 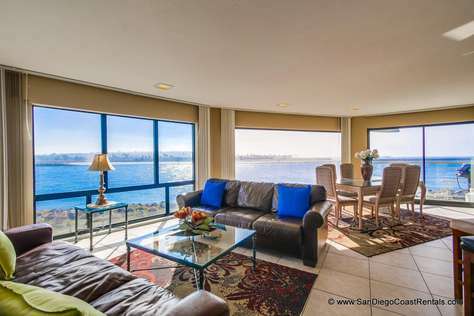 All San Diego Coast Rentals come fully furnished, and fully equipped. 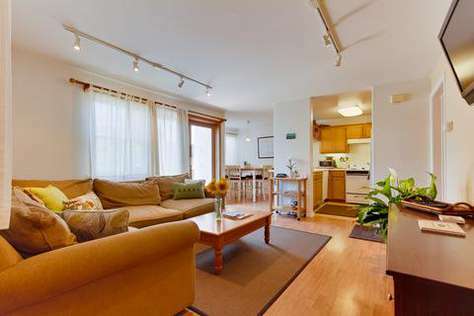 This one-bedroom non-smoking premium cottage was fully remodeled and refurnished in 2011. The bedroom enjoys a queen-size bed, LCD-TV with DVD player and an adjoining bathroom. There’s also an inflatable queen-sized air mattress that can be used in the family room for children or other guests. The living room sports a comfortable couch, LCD TV/DVD player and coffee table as well as a shallow desk and chair. The kitchen is chipper, and offers a gas stove, stainless steel dishwasher and matching full-sized fridge and plenty of counter and cabinet space. A washer and dryer are provided for your convenience. A coffee maker, microwave oven, blender, pots and pans, dishes, silverware, etc. are also included. The house stereo includes a CD player. Of course, the place enjoys WiFi, too! Outside, the rental enjoys private off-street parking and its own private deck with outdoor barbecue. There are two loungers for taking in rays, and a wrought iron table and chairs for that A.M. coffee, oceanside lunch, or evening cocktails. When you’re ready to head out, there are 2 Beach Cruiser Bikes for a casual ride, or take either of two Boogie Boards and catch some waves! There’s even an outdoors hot and cold shower, so you can rinse the salt water and sand off when you get back! This tranquil Mission Bay Park court property is just north of the 8 Freeway, and there’s a direct route to the San Diego International Airport. Enjoy browsing the area stores, or head into San Diego for a real day of shopping! There are marinas nearby as well, offering whale watching, rental and charter boats, and tours. The many family attractions of San Diego await you. Or stay there at the cottage and enjoy a peaceful vacation in this charming private beachfront paradise! 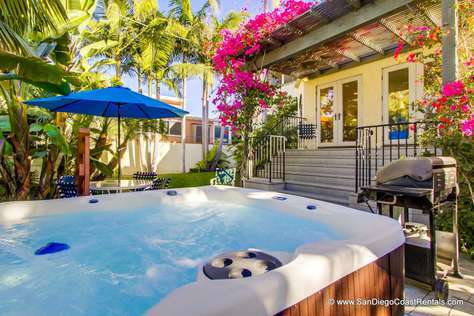 Relax at this tucked away gem located on the edge of Pacific Beach along beautiful Mission Bay!!!! 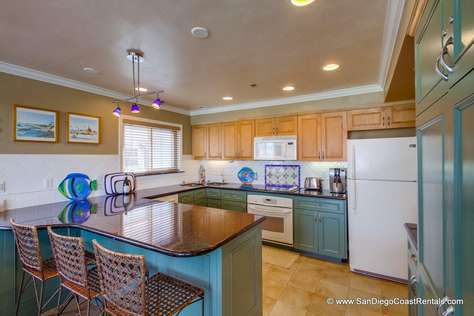 This unique condo is located in the ideal location for families or small groups looking to experience beach living in San Diego but also be able to relax while on vacation. The layout of this condo is really cool and boasts a living room on the main entry floor of the unit with the kitchen, dining, & both bedrooms (each with private full bath) are located on the lower floor. One bedroom has a patio slider leading out to a patio area that also leads to the very large spa with direct views of Mission Bay! Fanuel Park is next to the complex with has one of the premier playground / beach areas for children of all ages. We offer free parking (1 spot) with this unit as well as all utilities including free WiFi are included as well. We look forward to serving you while you enjoy Pacific Beach living at it's finest!!!! The L-shape Building complex is right on the Ocean Front. Completely remodeled in 2012, with clean dust free, allergy free Travertine style flooring. You'll find a high end decor with beautiful throw rugs, colors that will enliven your vacation fun with added energy. This particular condo has the Greatest Pool View, Turquoise waters right outside your window. This condo is within a few feet of the Whirlpool Hot Tub Spa & Suntanning Deck. Also very convenient to the outdoor BBQ & tables in the courtyard for an easy picnic after the beach days activities. The Living Room has a large window that you'll enjoy the serene pool waters from, the turquoise waters can also be seen from the dining room & kitchen. This spacious room has seating for 6 - 8 people. A great place to watch the large flat screen TV, with a multitude of cable channels to choose from, or CD/DVDs can be played. Comfy leather furniture with fun lively accent colors adorn the space that your family & friends will enjoy. Bring those photo Cd's or DVDs you rarely have time to watch at home. Here you will also find a desk, for your computer with WiFi access. The kids can be watched while they complete their school work here on vacation. A 24/7 technician is available for no charge to you, if you need help with any technological problem. Or you may choose to curl up on the sofa & read the many books available, while gazing out to the turquoise waters. The dining room, seats 4 at the round table + 2 more at the bar between the kitchen & dining spaces. This room is spacious enough to also be used as a sleeping area. Complete with 2 twin beds, in a trundle day bed set up. The bottom bed pulls out entirely & can roll out separate of the top twin, for more privacy & space. Both beds have comfortable spring coil mattresses, not pieces of foam. Very nice for two adults also. When you are not sleeping here, the two roll within, to open up the space & it forms a day bed, so a child can read here, while adults watch TV. From the Kitchen the chef & sou chef can cook together. You'll enjoy a brand new kitchen, all new appliances & cabinets. It's an open space that looks out into the living, dining rooms, kids space + to the swimming pool beyond. All white, clean cabinets In & out, so sleek & contemporary. You will enjoy the side by side freezer/refrigerator in stainless steel, with a fresh water filter & ice maker, both with filters. A new White range, to cook from, with a microwave above, for quicker meals. The stainless steel double bowl sink & dishwasher will make clean up easy. complete with all the cookware, colorful dinner ware, you'll need if ;you don't choose to walk out the door & down the boardwalk to a multitude of restaurants in the area. This 11' x 7' kitchen also has a long bar top, for those guests that like to stand & talk to you while you cook. Or the two high bar stools are comfortable with backs. The counter as well as the bar is fabricated from a beautiful granite that coordinates with the entire condo. The kitchen accent colors are bright & cheerful to add to your fun. Two bikes are provided with each condo, for your added pleasure of wheeling them out to the boardwalk in front of the building & riding miles along the Pacific coastline. If there are more in your group, a bike rental shop is 2 blocks south, of the condo, or for air-fills. The bathroom layout works great for several people getting ready together. You'll find a separate vanity & sink area with a 6 ft. closet, dressing space, mirror, lighting, etc. Inside the main bathroom are another sink, vanity cabinet, toilet, shower/tub combo, with new clear glass sliding doors & towel bars. Everything is clean white, new fixtures & freshly painted. You'll love the fun purple, lilac & alive colors in this bathroom & dressing area. The large master bedroom towards the back of the condo, will provide you a restful quiet nights sleep. Here you'll find a top of the line mattress with a pillow top for added comfort. The bedroom has a separate wall mounted TV, between bookcases, with DVD player. There is large closet the length of the room, with 4 mirrored doors. The queen canopy bed will set the mood for intriguing romance. Or if you love to fall asleep to reading your favorite book, there are convenient lights within reach. Rich tones of magenta, purple, blue & lime adorn the master room. New high thread count sheets are sure to lure you to rest. This room gets lots of natural sunlight, ocean breezes & at night you can hear the waves lapping up the sandy beach out front of the building. Before bed you can tip toe out to the jacuzzi/hot tub to sooth those tired muscles of the day, perhaps from boogie boarding, biking, beach walks, etc. The hot water pool is at the end of the swimming pool, so close & convenient to your condo. Art lovers will be inspired here at this lovely condo. The walls are full of Original Artworks, that you may purchase as a souvenir. Watercolors, acrylics, & mixed media will delight your senses & motivate you to pursue your dreams. You'll come back from Vacation refreshed, in love with life, and healthier than before. For those Yoga enthusiast, walk 3 blocks north to Law Street park, where there is a large grassy lawn to do yoga at. Weekend mornings there are classes by donation, or perhaps you'll find others during the week. Life does not get much better stretching out on a cliff over looking the Pacific Ocean. Sitting in your beach chairs on the grassy knoll out front of the building, watching the sun set over the Sea, is one of our favorite memories. This is San Diego vacationing at its finest! You won't find a better location, or more private and quiet building. This home away from home is perfect for families. There is a King bed in the master bedroom and 2 twin beds in the second bedroom (can be converted into a 2nd King upon request). There is also a full size pullout sofa in the living room to provide extra flexibility. San Diego's finest beach is just steps away, and it is easy to take the kids to Sea World for the day as it is only 2 miles away! You can rent bikes, surfboards, (or take lessons for those of you who have always wanted to try! ), rollerblades, jet skis and other recreational equipment all just around the corner! Or you may join a game of sand volleyball or just work on your tan! You are also just a short walk or bike ride from the famous Belmont amusement park and The WaveHouse. And that's just during the day, for those of you who like a little nightlife, Pacific Beach is just a couple of miles up the road. 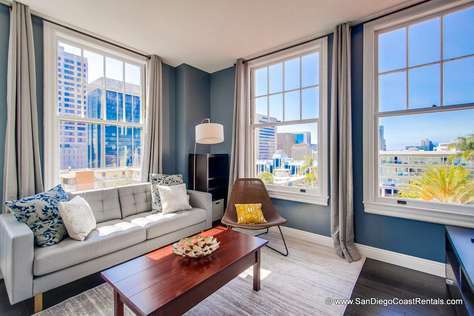 Or you can head downtown for a night in San Diego's famous Gas Lamp District, or to Petco Park for a Padres game! The possibilities are endless! 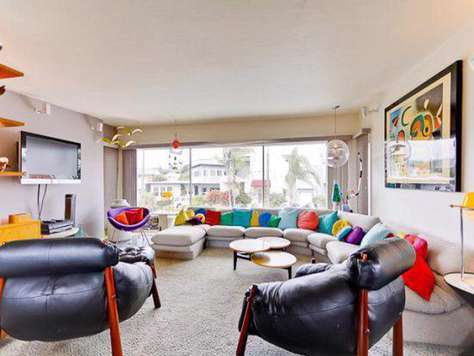 This condo is located in South Mission Beach. This end of the beach offers quiet accommodations with easy access to all the activities Mission Beach has to offer. Recently renovated, it has all of the most modern amenities and fixtures. Our unit is located on the ground floor and has 2 private patios with furnishings and gas BBQ. We also offer a private garage for 1 car so you don't have to deal with the hassle of finding parking along the street. 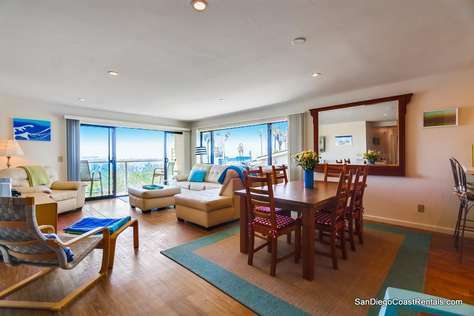 Fall asleep and wake up to the gentle crash of the ocean waves in this beautiful ocean front condo in Mission Beach. 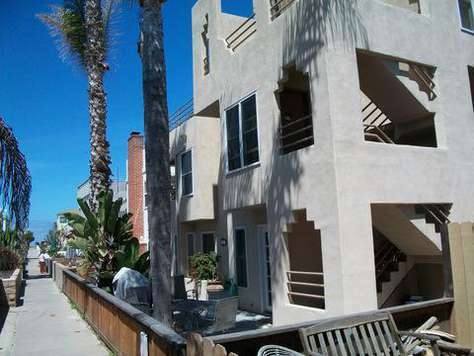 This second floor condo looks right out onto the beach and the famous Mission Beach boardwalk. You can literally feel sand between your toes within a minute of stepping outside and walking toward the beach. Of course, you’ll also enjoy your time indoors. This comfy condo is fully furnished and includes a master bedroom with a queen bed and a second bedroom with two twin beds, making this a great option for a romantic getaway or for a family vacation to San Diego. The condo includes a fully-functional kitchen, a roomy den that is perfect for watching a movie at night and a balcony that looks right out at the ocean. 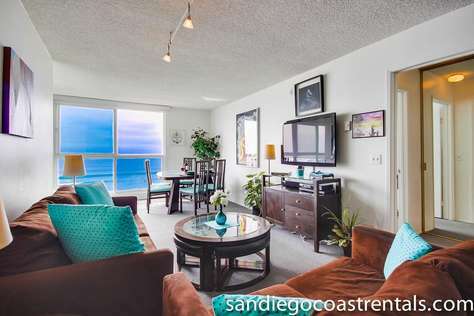 At the Ocean Front Paradise rental condo in Mission Beach, you can take a relaxing jog or stroll down the boardwalk in the morning, have a late lunch on the balcony overlooking the ocean and then enjoy all of San Diego’s nearby treasures during the afternoon. At night, San Diego’s famous Gaslamp Quarter offers a wide array of restaurants, trendy bars, music and entertainment options. It doesn’t get much better than that! 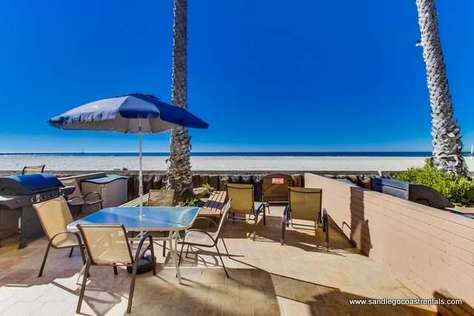 This ocean front condo has one of largest private patios on the boardwalk in San Diego's Mission Beach. Although the view and easy beach access are worth the price alone, we have done our best to make sure you will enjoy your stay and be comfortable indoors as well as out. This 2 bedroom / 1 bath unit is furnished with relaxation in mind. The huge private patio has patio furniture with umbrella, a gas grill, outdoor shower, and of course, the million-dollar view. We also provide beach chairs along with a few beach toys. The master bedroom has a queen bed and the 2nd bedroom has 2 twin beds. There is also a full size sofa sleeper in the living room. We also provide open air parking for one car. It's all here, come and enjoy it! Mission Beach is one of San Diego’s most popular beach destinations. It is here where you can enjoy what everyone comes to the beach to enjoy. Do you enjoy miles of boardwalk and beaches? Parks and picnics? 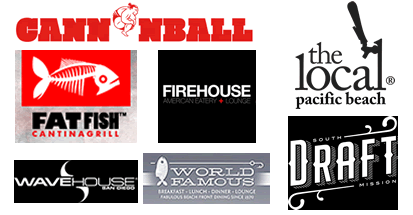 Bars and restaurants? Roller coasters, roller skates, and bicycles? Shopping and sightseeing? Rest and relaxation? Crashing waves and serene bays? A cool breeze and palm trees? Whatever it is you want to enjoy on your vacation, you may be able to find it just steps away from this oceanfront property. 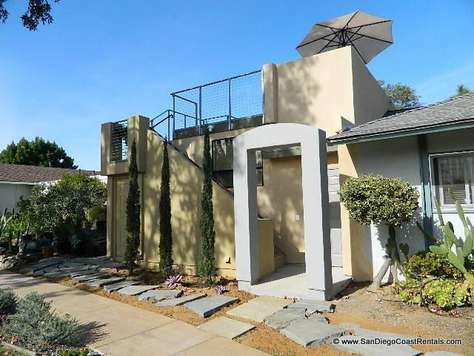 This 2 bd / 1 ba single level ground floor condo is located in the highly desireable area of Solana Beach overlooking Del Mar, CA and the Famous Del Mar Horse Racing Track & Facilities!! 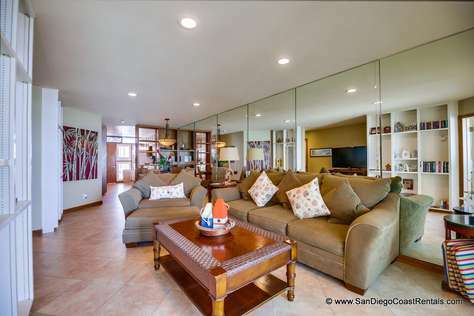 This property is located a quiet neighborhood ideal for a couples getaway or family vacation to San Diego. This property has two bedrooms (Master with 1 King bed, 2nd bedroom with 1 Full bed) and will accommodate up to Four (4) guest. Guest will have access to private rooftop deck boasting ocean, mountain, & lagoon views! Guest also will be able to enjoy the private patio with many shrubs and plants to provide relaxation and zen while drinking your monring cup of joe! Guest will have access to parking for up to two (2) cars located in the dedicated spaces for this property which are in front of the garage door and 2nd spont next to it on the right. Simple, elegant luxury. That’s what you’ll enjoy in this 2-bedroom oceanfront condo. Gaze out on the Pacific Ocean from the comfort of your bedroom. Enjoy a meal in the dining room while you take in an amazing view of Crystal Pier. Let the sound of the ocean’s waves soothe you to sleep. Wake to the sound of the surf gently lapping at the shore. This is the way a San Diego vacation should be! The condo unit is located within a secured building. Guests have dedicated underground parking. The building’s amenities include both a pool and separate outdoor Jacuzzi, as well as coin laundry facilities. There’s a BBQ area, and elevator service. The beach is right there adjacent to the grounds, so you can go straight on out to enjoy surfing (or watching others do so,) take a Boogie Board out into the waves, sunbathe, or just take a barefoot walk along the sands. At Crystal Pier there are small shops and eateries, a coffee shop with Internet access, fine dining establishments... You’ll find bicycle and board rentals, a supermarket, and beachfront dining, all within an easy walk. For something more formal, Tower 23’ Hotel has a restaurant as well. Boutiques, spas and salons, abound! There’s plenty to do both day and night in San Diego. It’s a very health-conscious city, and most every dining experience imaginable is yours for the choosing. Feel like going south of the border? Tijuana, Mexico is just a short bus or train ride away. There you’ll find souvenirs, bars, clubs, pharmacies, and every other service and experience you’d expect from a border town. Or stay stateside. Either way, there are more things to see and do than you could ever hope to get to in a week or three! When you return to your 1,000 square foot beachfront home, you’ll find every modern convenience there at your disposal. There’s a fully equipped kitchen with an oven, electric glass-top infrared stove, microwave, full sized refrigerator, dishwasher, blender and a coffeemaker. Linens, towels, dishes and utensils are there, at ready. The unit provides cable, a DVD player, Stereo and CD player, TVs in the bedrooms and living room — everything you’d have at home! It really doesn’t get much better than this. You’re staying in a pet-free, smoke-free condo on the beach, and everything is conveniently located. Just a short ride takes you to the San Diego International Airport, the San Diego Zoo, Balboa Park, and all the other amazing attraction that make San Diego an awesome destination. Ocean Point II is an excellent choice for your next vacation. About a hundred paces from the beach, this modern, spacious 2-bedroom, 2-bath condo is ideal for those looking to relax, yet just as well suited for the outdoors types who want to enjoy a busy schedule all day long. Situated on the second floor, you’ll enjoy proximity to the ocean and privacy as well. There is a garage space (6’ maximum height) to pull into once you arrive. Chances are good you won’t be using it much, because this place is within walking distance of EVERYTHING! Boutiques, restaurants, pubs, grocery stores, bike and board rentals, whatever you’re after, it’s all right there waiting for you! This unit is especially well furnished for families and larger groups. There is a queen-sized bed in one of the bedrooms, and a large, expandable bunk bed in the other. The huge sofa is also a sleeper; In all, this place can comfortably sleep eight (including children). Zanzibar Retreat is pet-friendly as well (with a cleaning deposit). Like all of our rentals, the Zanzibar Retreat comes fully furnished and equipped. There is a gas stove, microwave, dishwasher, and coffee maker. Pans, dishes and utensils are also included, as are linens and towels. Enjoy morning coffee at the formal dining room table, or take it out onto the balcony and sip at the java as you enjoy the tranquil sound of the nearby waves. There’s no lack of activities and attractions in San Diego. From the world-famous San Diego Zoo (that feels much more like a wildlife park) to the Gaslamp District in the downtown section, to Sea Port Village, you’ll be busy as much or as little as you like. Check out Balboa Park, take in a whale-watching cruise, spend a day shopping. Or just kick back, catch some rays, or read a book by the fireplace. The Zanzibar Retreat is at your disposal, the choices are all yours. 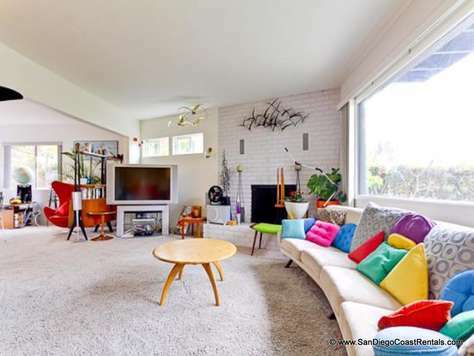 Enjoy this mid century modern residence in North Pacific Beach, just 1/2 block to the Ocean and Palisades Park. Enjoy the 2-3 minute walk down to the beach to wiggle your toes in the sand, to walk along the surf line, or to take a long walk on the boardwalk to Mission Beach, restaurants, Belmont Amusement Park and the jetty. Sit on the large private deck to enjoy the view, the spectacular sunsets, the ocean breeze, the sounds of the ocean and the feel of the tropics, or climb the spiral staircase to the rooftop deck for a more expansive view and to watch the surfers. This spacious and unique two bedroom two bathroom home, the top unit of a duplex, has all the amenities you need to enjoy a short or extended stay. Sit on the large private tropical patio to enjoy the view, the sunshine, the ocean breeze, the sounds of the ocean and the feel of the tropics. This spacious and unique two bedroom two bathroom home, the bottom unit of a duplex, has all the amenities you need to enjoy a short or extended stay. 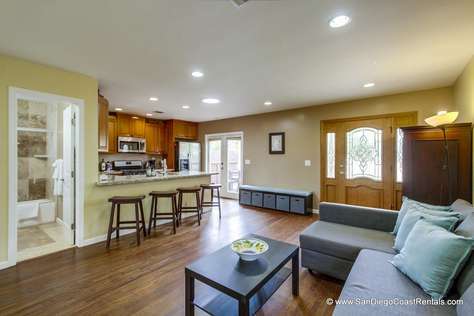 Enjoy this newly remodeled private home located in the hills of the Bay Park area of San Diego, CA. 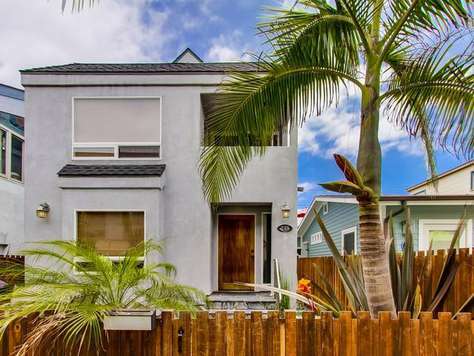 This home has panoramic views of Sea World, Mission Bay out towards the Pacific Ocean and is perfect for families looking for the privacy of a single family home while still being in close proximety to all the sites and attractions America's Finest City has to offer. This home boast 2 levels with tons of westward facing views and has 3 bedrooms and 2 full bathrooms. The home will sleep up to 11 guest max (7-8 adults max) and has off street parking for 2 cars. All the furnishings, bedding and linens, electronics, amenities, etc. are brand new as of October 2018. 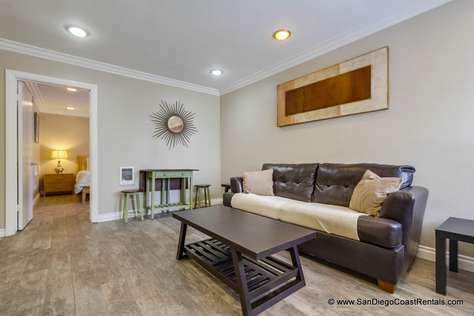 This property is just a short drive to tons of shops, restaurants, and all the popular beach communities in central San Diego as well as the Downtown Gaslamp District. The best part of this home is the panoramic views from both indoors as well as the large private deck were the gas BBQ & gas fire pit are located. You'll be vacationing while living like a local while on your visit to San Diego, CA!!!! Relax by the ocean while staying in our Ocean Front Getaway! This condo is perfect for families and medium size groups looking to experience ocean front living without breaking the bank. This property has direct ocean views and plenty of space for guest to spread out while on vacation in San Diego, CA. 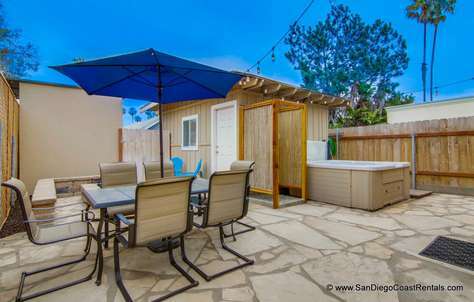 This property has dedicated off street parking for one car in a garage (6' clearance) There is also ample outdoor living space to hang out or sun bath in San Diego's year round sunshine! The ocean front patio along the boardwalk is the highlight of staying ocean front. The ground floor patio is a shared patio with other units in the building but the north end of the patio is designated specifically for this unit.The main living area of the property is located on the 2nd floor were you will find the living room, kitchen, dining area, as well as the master bedroom and one full bath. There is also a small balcony facing the ocean off the living room area. The 3rd floor has 2 other rooms as well as the 2nd full bathroom. 3rd floor balcony is off limits to hang out per HOA rules. That area is strictly a fire emergency exit. We look forward to assisting you with your accommodation needs while staying at our Ocean Front Getaway!!!! Beautiful 3 bedroom 3 bath townhome located 3 blocks from the ocean. 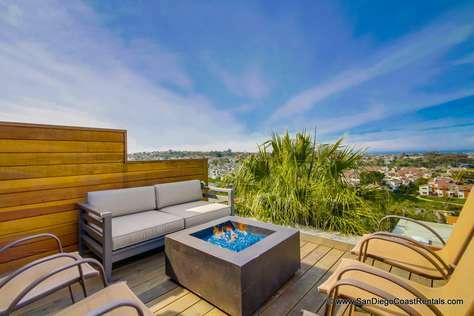 This three story property has a rooftop deck with 360 degree views of the Pacific Ocean, Mission Bay and Mount Soledad. It's the perfect place to relax and watch the sunset, or enjoy nightly SeaWorld fireworks shows during the summer! The ground floor features a spacious studio with kitchenette, bathroom and queen sofa sleeper. On the second floor you will find the master suite and second bedroom. The master features a king size bed and private balcony. The second bedroom is furnished with twin size bunk beds and all bedrooms have top of the line flat screen televisions. The third floor is the living room and kitchen common area with brand new appliances and furniture throughout. Living room also has a queen size sofa sleeper for additional guests. Large third floor balcony features a grill and ocean views. Above the kitchen, the spacious rooftop deck allows for 360 degree views and private relaxation while drinking in the beauty of beachside San Diego living. All floors have air-conditioning if the ocean breeze isn't enough on those extra hot summer days. The unit also has in-home washer and dryer, and parking for two cars (one in garage, one in the driveway). Owner has also provided beach cruiser bicycles, boogie boards, beach chairs and other amenities to make your vacation here as easy and enjoyable as possible! This is a beautiful 4 bedroom 4 bath home located 3 blocks from the ocean. This three story property has a private rooftop deck with 360 degree views of the Pacific Ocean, Mission Bay and Mount Soledad. It's the perfect place to relax and watch the sunset, or enjoy nightly SeaWorld fireworks shows during the summer! The ground floor features a spacious studio with a queen sofa sleeper and a full bathroom. On the second floor you will find the master suite and second and third bedrooms. The master features a king size bed, full bath, and private balcony. The second bedroom is furnished with a queen size bed as well as a twin trundle bed with attached full bathroom. The third bedroom is also furnished with a twin bed. The third floor is the living room, dining, and kitchen common area with brand new appliances and furniture throughout. There is a full bathroom on this level as well. Large third floor balcony features a grill and ocean views. Above the kitchen, the spacious rooftop deck allows for 360 degree views and private relaxation while drinking in the beauty of beachside San Diego living. All floors have air-conditioning if the ocean breeze isn't enough on those extra hot summer days. The unit also has in-home washer and dryer, and parking for two cars (one in garage, one in the driveway). Owner has also provided beach cruiser bicycles, boogie boards, beach chairs and other amenities to make your vacation here as easy and enjoyable as possible! 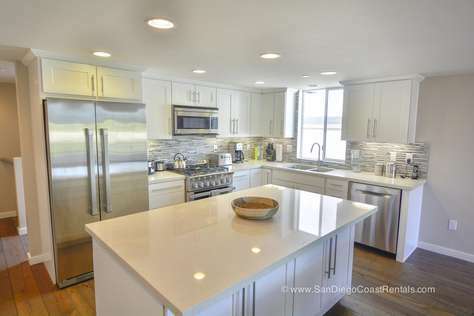 Looking for your own premium ocean-view house to rent while on vacation in San Diego? Your search is over! This spacious three-story house is just a hundred paces to the beach, and offers every imaginable comfort and amenity — everything you need for an unforgettable vacation! Electronics include cable, TV, DVD, a surround-sound system, a stereo with CD player, and WiFi Internet. All linens, towels, utensils, pots, pans and dishes are provided, of course, and there’s a washer-dryer in the house too! The house also enjoys a 2-car garage. In short, all the comforts of home! The back yard patio area sports a deck and offers outdoor seating, a gas BBQ, and makes a great place to sip morning coffee or enjoy an evening cocktail. Or enjoy a view of the ocean from any of the three balconies. Ready to step out? Hit the beach for surfing or Boogie boarding, take a stroll (or bike ride) down the boardwalk, play volleyball, or just lay back on our beach chairs and soak up the rays! Your vacation time here on Whiting Court can be as relaxing or exciting as you like. Ready to take in the sights? Mission Bay is behind you, with the boats bobbing at their anchors. SeaWorld is just a five-minute drive, world-famous San Diego Zoo and Wild Animal Park not much farther! There are lots of family fun destinations, like Legoland, for example! If you enjoy wines, you’re an hour from Temecula’s wine country. Charter a boat and go fishing or sailing. Head out on a whale watching tour and see the dolphins and whales up close, in their free and natural environment! Or head south of the border for a day in Tijuana. There’s no shortage of things to see and do in San Diego! Your tropical adventure in San Diego begins when you open the custom mahogany front door of the Crown Point Luxury rental. Crown Point Luxury is one of our premiere properties, and is the perfect way to spoil yourself, your family, and your friends when you visit San Diego. This completely remodeled home offers 2,400 square feet of luxurious living space that includes four bedrooms and four bathrooms, as well as 10,000 square feet of outdoor space. Crown Point Luxury is decorated in a tropical, contemporary design. You’ll notice how spacious and welcoming this large house is the moment you step in the door. Original artwork decorates the walls, and the granite countertops throughout the house add a feeling of elegance. Large windows and skylights let in plenty of light, so you can really get a taste of the tropics. Crown Point Luxury offers two king beds, one queen, and a pull-out sofa for your group. This rental is the perfect option if you want to bring the spouse and kids to San Diego along with other members of your family. It can also be a great choice for a group of friends. Two of the bedrooms include private baths, with beautiful tiled walk-in showers and lots of sink space. Some of the bedrooms also include large, flat-screen televisions with Direct TV. 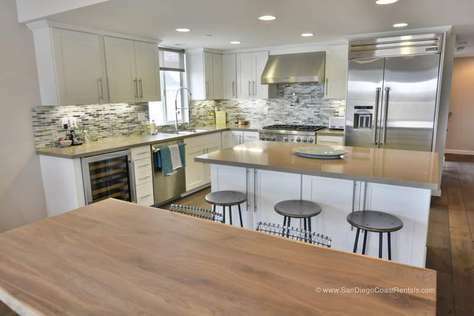 San Diego offers lots of amazing restaurants, but you might not even want to go out to eat with all that this spacious kitchen offers. The kitchen is completely open, allowing multiple people to cook together at the granite countertops or central island. You can eat at the breakfast bar in the morning, or settle down for a more formal meal at the dining room table below a capiz chandelier. 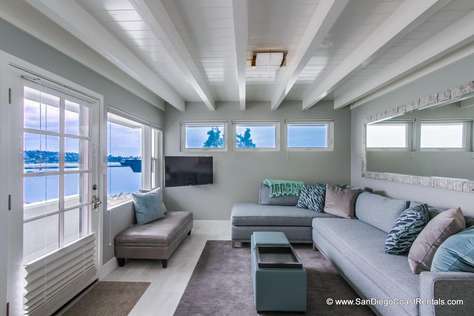 Relax after all your San Diego adventures in the large, open living room, which features a comfy couch, large fireplace, and picture window that looks right out at the salt water pool. A 65-inch flat screen television with surround sound is a great option for catching the game or watching a movie together at night. Of course, this is San Diego, so you can’t spend all your time inside. Step outside and enjoy a dip in the salt water pool. The hours will speed by as you play in the water or catch up on some reading poolside. When the night grows chilly, it’s time to move to the warm Jacuzzi, or get ready for a meal under the stars. Enjoy sipping wine or some of San Diego’s famous craft beer under the large, custom Palapa Bar with built in barbecue, sink, and outdoor refrigerator. For an even better view of the property and more relaxation options, head up to the roof-top deck. Lean back in the comfy chairs, and watch the fireworks from Sea World at night. 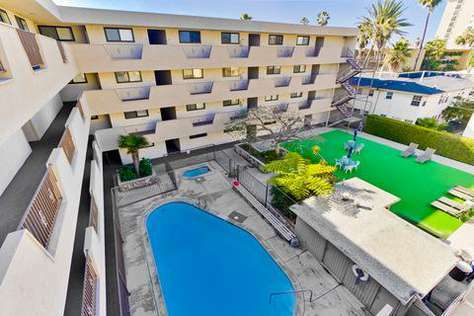 Crown Point Luxury is located in the bustling city of Pacific Beach, a hip area filled with bars and restaurants. This coastal city offers quick and easy access to the beach and to Downtown San Diego. Within a short drive, you can take the children to Sea World, or enjoy the classy wine bars and fine dining in San Diego. A quick car trip can also take you to some of the best golf courses in the country, as well as luxury spas and tennis clubs. If you’d rather keep the car in the garage, take a walk right from the house to Mission Bay or Crown Point Shores Park. All that San Diego has to offer is practically outside the door! 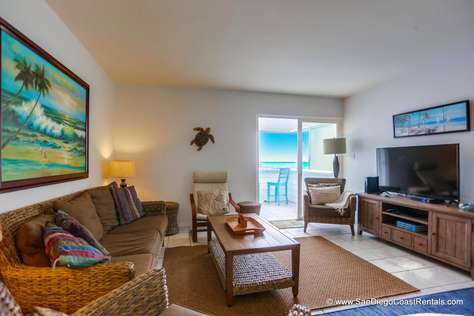 All San Diego Coast Rentals come fully furnished, and fully equipped. The master bedroom in this unit has a king size bed, private bathroom and its own private balcony. The 2nd bedroom also has a private balcony and the queen size bed. The 3rd bedroom is equipped with a queen size bed and has a semi private balcony. The 4th bedroom has a full-size bed, and a full-sized futon. 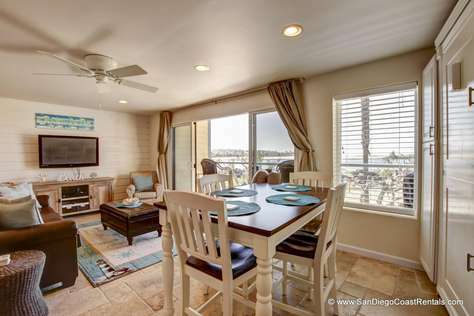 Plenty of room for your group or family to enjoy during your next vacation to San Diego. The main living area enjoys breathtaking views from almost everywhere inside the unit. The kitchen is outfitted with everything you need to prepare meals at home. The comfortable living room has a large flatscreen TV with a DVD player. There is also a stereo system in the living room, plus wireless highspeed Internet. The condominium has a private washer and dryer in the unit, and on the patio there is a gas BBQ. Parking is situated in a secure gated area with 2 private spaces. Right outside your front door is a long stretch of sandy beach and the South Mission Jetty. With easy access to the beach, you will find local shops that rent surfboards, bodyboards, paddle boards and all the beach gear you need. A short drive away you will find several marinas that offer several deep-sea fishing charter boats and water front or sailing tours. You are located just minutes from Sea World, and dozens of restaurants, nightlife, and shopping opportunities in the South Mission Beach area. Within a short drive you can visit the San Diego Zoo, downtown San Diego, and family attractions such as Legoland. Balboa Park, Museums, and the Birch Aquarium. Whether you're looking for Family Fun, a Romantic Getaway or Rest & Relaxation, this sunny and bright Ocean View Paradise has it all! Come play at the beach or kick up your feet and drift away to the sounds of the waves crashing. You also have two private balconies on the west side of the building with un-obstructed views of the Pacific Ocean and mission beach jetty (were boats enter / exit Mission Bay to the ocean) You can also sit on the patio on the east side of the building and watch the SPECTACULAR nightly Fireworks show (in the spring and summer months) from Seaworld! Come and enjoy this beautiful and relaxing, gated, 3 – 4 bedroom, 2.5-bath waterfront condominium in south Mission Beach with 180-degree views of the beach and ocean This spacious, third-floor condominium is perfect for multi-families or couples looking to get away for a nice, relaxing vacation. Relax and unwind on the beautifully tiled and furnished balcony or catch some rays on the sand or in the water. Just steps away from the ocean boardwalk, one short block from the bay. This condominium is approx. ¼ mile south of the famous Belmont Park Roller Coaster, a five-minute drive to Sea World, and just a short drive to the San Diego Zoo and the San Diego Wild Animal Park. It is also just a few miles from downtown San Diego, the San Diego Airport, and La Jolla's famous tide pools. Whether it is family fun or rest and relaxation you are looking for, this condominium has it all! eventful days at the beach or many of San Diego theme parks and tourist attractions. This home is located just a short drive to Del Mar and La Jolla beaches were you'll find some of the most desirable coastline in all of California. outdoor dining area, gas BBQ, & ping pong table. We look forward to assisting you with your accommodation needs while staying at this premier private home! The coolest camping experience for a small family or couple! Visit America's Finest City while having a camping experience and saving funds to visit all the attractions. This brand new 17 foot travel trailer delivered to your previously booking camping spot / location will be the ultimate way to visit our beautiful city. 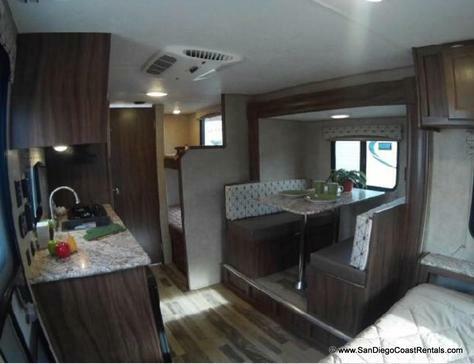 This trailer sleeps 4 guest perfectly and we provide almost all the essentials to have a great walk in and walk out caming experience in San Diego, Ca. 1 Queen bed in front of trailer. 2 extra long twin bunk beds in rear of trailer. Dining table for 4 (slide out) as well as 2 burner stove top, microwave, mini-fridge inside and small kitchen sink as well. Bathroom has toilet and tub/shower combo. We also provide 4 beach chairs, 6' folding table, 10 X 20 mat for the front hang out area, & a few extra beach / camping items. One full propane tank provided with each rental.